British Prime Minister Theresa May has held top-level Brexit talks in Berlin and Paris as she seeks support for another extension. Mrs May met German Chancellor Angela Merkel, and French President Emmanuel Macron, today. Following Mrs May's discussions with Mrs Merkel, a Downing Street spokesperson said: "Ahead of EU Council tomorrow, the leaders discussed the UK's request for an extension of Article 50 to June 30th with the option to bring this forward if a deal is ratified earlier. "The Prime Minister outlined the steps the government is taking to bring the Brexit process to a successful conclusion and updated Chancellor Merkel on the ongoing discussions with the opposition. The spokesperson continued: "The leaders agreed on the importance of ensuring Britain's orderly withdrawal from the European Union." 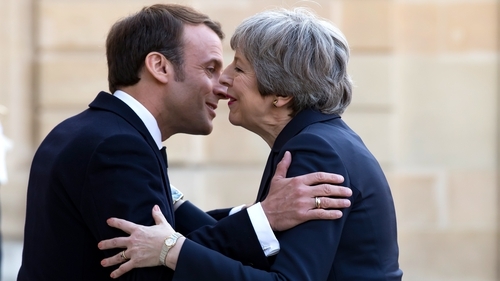 Following the talks between Mrs May and Mr Macron, a Downing Street spokesperson said: "The Prime Minister updated President Macron on the ongoing talks with the opposition to agree a way forward that respects the result of the 2016 referendum. "They also discussed upcoming European Parliamentary elections with the PM saying that the government was working very hard to avoid the need for the UK to take part." All 27 EU heads of government must agree to an extension if the UK is to avoid the default position of a no-deal Brexit on Friday night. Mrs May is expected to ask for an extension to 30 June in order to get a deal through parliament. Draft conclusions to be presented to the leaders at tomorrow's meeting show the EU will grant Britain another delay to Brexit with conditions, including holding European Parliament elections. DUP Westminster leader Nigel Dodds has described the talks between Mrs May and the leaders of France and Germany as "humiliating and embarrassing" for the UK. This afternoon, the Taoiseach said he was confident that a Brexit extension will be offered. However, Leo Varadkar said there are different views around the length and conditions of any extension among member states, but he was confident an agreement could be reached. He said Ireland had no objection to a long extension, but warned that if it was very long it could interfere with some dates in the Withdrawal Agreement. Speaking in the Dáil, he said the UK's request to leave the EU as soon as it reaches an agreement in Westminster was reasonable. Last night, the House of Commons and the House of Lords backed a new law to extend the Brexit process. It resulted in a motion being tabled this afternoon for Mrs May to seek an extension to 30 June - a move backed by MPs by 420 votes to 110, a majority of 310. Meanwhile, the Labour Party has said it has not yet seen a clear shift in Mrs May's position after further talks with the government today aimed at finding a way out of the Brexit impasse. "We had further detailed and wide-ranging talks with cabinet ministers and officials today," a Labour spokesperson said. "We have yet to see the clear shift in the government’s position that is needed to secure a compromise agreement." The two sides have agreed to continue their talks tomorrrow, Labour said. Earlier, Mrs May's spokesman said today's talks were wide-ranging and productive.